Mason Buttle is a good, good boy. Moonie Drinker is a good, good dog. They make “The Truth as Told by Mason Buttle” shine like the sun. In the world created by author Leslie Connor, Mason is the tallest, sweatiest kid in the seventh grade in what was once a rural community that is now being overtaken by housing developments. He has dyslexia, synesthesia, and a sweet innocence. All of these personal characteristics have doomed Mason to a sad, shy life. Although he is bigger than they, neighborhood kids bully him, pelting him with apples and lacrosse balls as they walk to their homes. Mason would be lonelier if it weren’t for his grandmother and his Uncle Drum with whom he lives. He would have a good bedroom in his home if it weren’t for Shayleen, whom Uncle Drum brought home one night. Shayleen almost never goes out, orders things from the Shopping Network, and complains about everything. And has taken over Mason’s bedroom. No one understands why Uncle Drum brought her home. If Benny Kilmartin hadn’t died, Mason would also have a best friend. 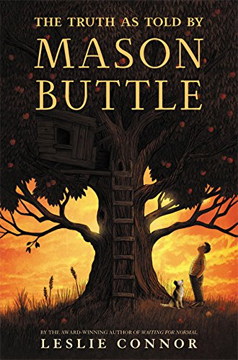 The saddest part is Benny died from a fall from the apple tree in Mason’s family’s apple orchard in which Mason and Benny had built a tree house. Together Mason and Benny suffered the slings (literal and figurative) and arrows of the neighborhood bullies. But now Benny is gone, and a sadness lingers over Mason’s house and the orchard. Also, Lt. Baird keeps coming back to see Mason, trying to get him to remember details of Benny’s death. It seems sometimes that he wants Mason to remember things that didn’t happen, which confuses Mason. It has been a year and a half since Benny’s death, and the lieutenant keeps returning to their farmhouse, or the “crumbledown,” as Mason nicknames it. The school counselor, Ms. Blinny, is a constant comfort to Mason as he struggles with his schoolwork and the bullying of the kids. She is compassionate, goofy, sweet, and clumsy. She has taken the old letters of “Social Work Office” and created “Swoof,” the office where kids can come to talk into Ms. Blinny’s listening ears. In Swoof, Mason finds “the Dragon,” a talk-to-type dictation program that translates Mason’s thoughts into typewritten words. It’s a small freedom for him that turns into a large blessing. In Swoof one day, Mason meets Calvin Chumsky, a small, white-haired, gentle soul who soon becomes his new best friend. Also, Mason is often asked to dogsit Moonie Drinker, who belongs to the family of one of his tormentors. Together Mason, Calvin, and Moonie share small adventures. One day they discover an old root cellar on the farmhouse property, and it becomes their secret club house. Mason can put up with almost anything, including the strange lethargy that seems to have overtaken his household, now that he has Calvin and Moonie. But, of course, tragedy must strike again. It provides the impetus for wrapping up the mystery that has accrued around Benny’s death, dispelling his family’s lethargy, and maybe saving Mason’s life. “Mason Buttle” is a wise story about caring for people, choosing gentleness instead of violence, and how to be trustworthy and loyal. This is a wonderful story for children (maybe not for eight-year-olds unless they are precocious) and adults.